This dish has some of my favorite flavor profiles and I’ve enjoyed letting it evolve over the past few years. 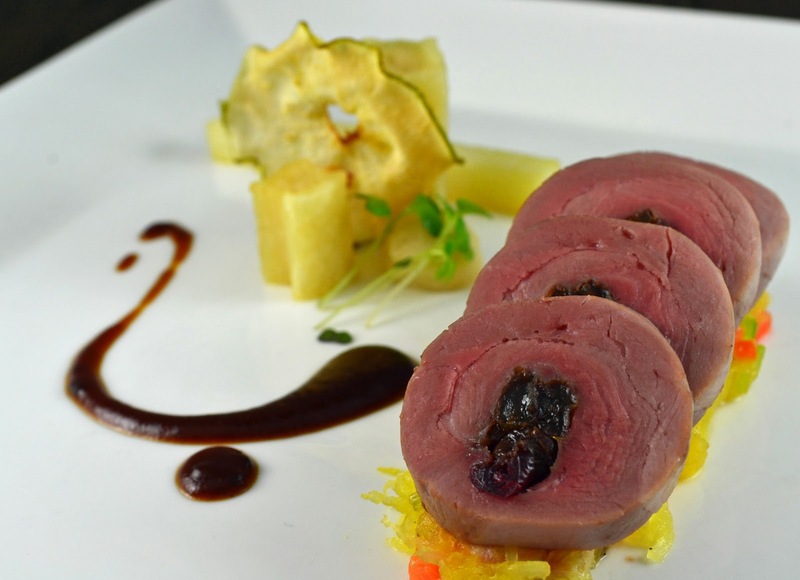 This preparation includes a roulade of duck breast with the skin removed, which has been filled with dried cranberries, raisins and candied pecans. The spaghetti squash was roasted and tossed with bacon, mirepoix, butter and seasoned with kosher salt and ground white pepper. Idaho potatoes were cut into tubes, then blanched and filled with a roasted pear-potato puree. A dried pear chip offered texture and additional sweetness. The demi was prepared with fortified veal stock, and flavored with thyme, roasted shallots and cherries. The roulade was prepared by removing the skin from the duck breast before butterflying. A light dusting of Activa RM was applied to help the roulade bond tightly. A small line of dried fruit and chopped candied pecans (see previous post) were placed across the butterflied breast. It was then rolled tightly into a cylinder using plastic wrap and air bubbles were removed with a sausage poker. The roulade was allowed to sit for five hours to allow the Activa to fully bond before cooking sous vide at 137 degrees Fahrenheit for two hours. This dish was paired with a Penfolds Grange Shiraz from 1992, an excellent (and now rare) example of the varietal which Robert Parker awarded 98 points. Posted in Appetizer, Game, SpringTagged duck, duck roulade, roulade, squashBookmark the permalink.